Recently I reviewed the new self-tanning serum from Vita Liberata (here). 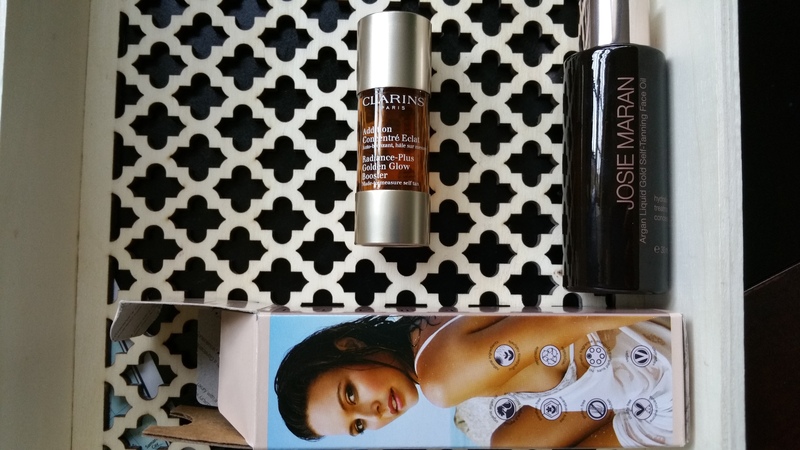 I’ve also been trying out Josie Maran’s new self-tanner for the face, called Argan Liquid Gold Self Tanning Face Oil (1 oz for $42), and I thought I’d review it along with an older product from Clarins, their Radiance Plus Golden Glow Booster (released last year I think) (.5 oz for $30). Vita Liberata’s, Josie Maran’s, and Clarin’s self tanners are all in liquid form, and I see this as one category, with all liquid, serum, and oil self-tanners included together. Since I’ve used it the longest I’ll start with my opinions on the Clarins Radiance Plus Golden Glow Booster self-tanner. The directions that come with this “booster” say that you need to mix it with lotion before applying it to your face. The concept is that if you instead add a few drops into your lotion you’ll end up with a custom self-tanner. You are supposed to screw off the cap, turn the bottle upside and press the dispenser bottom on the bottle to release a few drops. But the mixing method didn’t work for me. I don’t really have the patience for that kind of subtlety. When I feel pale I need color. So I went back to the directions. Nothing had changed there: the product packaging specifically says not to apply the serum directly to the skin. But something about that is both a challenge and a call to action at the same time… what will happen if I do….? It takes some skill to get the liquid on your face and spread evenly, without ending up with drips of it in odd places. You could apply it to a cotton ball first but I don’t do that because it wastes too much product. Anyhow, I have been very pleased with the color achieved from using the booster directly on my face. The booster itself seems to be unscented, which I really appreciate. ( I tend to stay away from Clarins skincare products because of their scent. ) With self-tanner though it’s not that I mind so much the resulting self-tanner smell, because I don’t think that can be helped. It’s the actual product scents that can bothers me with some facial self-tanners, and many body self-tanners. I would repurchase this Clarins booster serum, assuming I didn’t happen to find something even better before I run out. I’ll say that Vita Liberata is a definite competitor already. 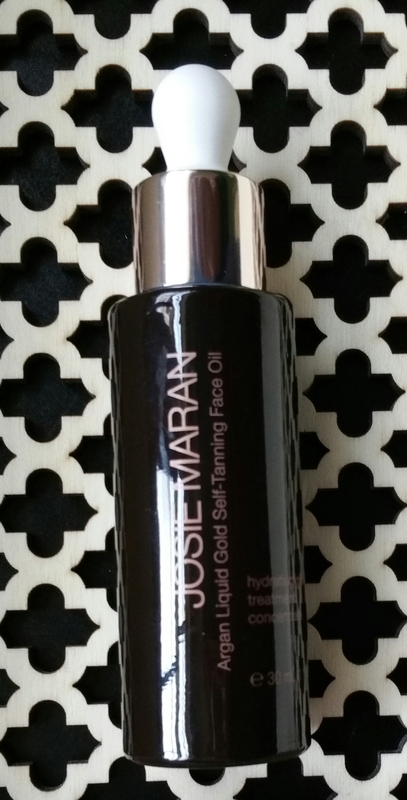 I’ve also been testing the new Josie Maran Argan Liquid Gold Self Tanning Facial Oil, which I found at Sephora. The first thing I noticed about this product when I received it is how heavy it is. That is a result of the glass bottle and larger volume than both Vita Liberata and Clarins’ serums. When you do the math you see that Josie’s is a better deal ounce per ounce ($42/ounce) than both VL ($90/ounce) and Clarins ($60/ounce). Josie’s product is dispensed via an eye dropper mechanism, which makes me the slightest bit nervous. 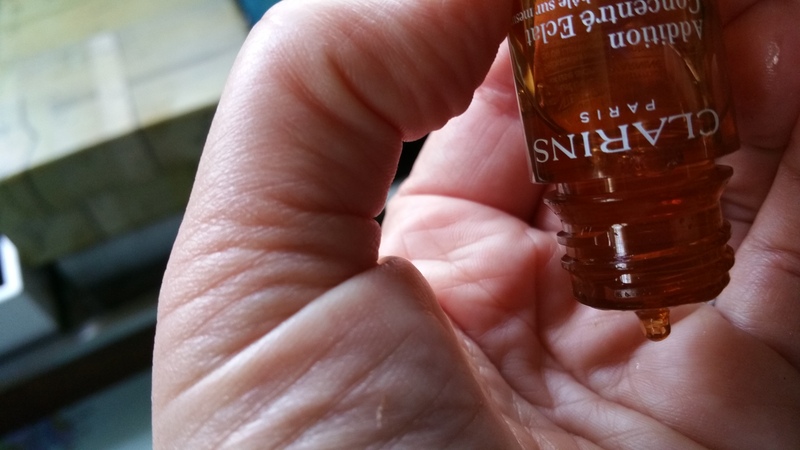 I’ve had some poor luck with similar dispensers, most notably from the St. Tropez Self Tan Luxe Facial Oil one, that broke when I still had oil left to use. But I’ll see how this one stands up to use. The oil itself is tinted, unlike that of VL and Clarins. So I end up with an instant bronzed glow with Josie’s oil. The oil smells rather strongly. Before re-reading the description from Josie, I personally thought it smelled of a vanilla latte. Turns out I’m not too far off– It’s supposed to smell like “Tahitian Vanilla.” True, I love vanilla. But I’m picky about it too. (Fav. vanillas: Diptyque Vanille Candle, Bobbi Brown/MAC Lip products, Henri Bendel Vanilla Bean Candle.) Basically I don’t like vanillas that are overly sickly sweet smelling or too sugary. Josie’s oil is a bit much for me in the vanilla area. I don’t hate the smell, but it gets annoying that I can smell it so intensely from my own face. I think the smell would bother me less if I were to use this on my legs or torso, because they’re father from my nose. It’s unfortunate that this product had to been scented so strongly because otherwise it has everything going for it. Josie Maran Liquid Gold Self Tanning Face Oil Ingredients: Water**, Propanediol**, Dihydroxyacetone**, Glycerin**, Cocos Nucifera (Coconut) Water**, Polysorbate 80, Caramel**, Hydrolyzed Viola Tricolor Extract**, Argania Spinosa (Argan) Kernel Oil*, Cocos Nucifera (Coconut) Fruit Juice**, Cichorium Intybus (Chicory) Root Extract**, Aloe Barbadensis Leaf Juice Powder**, Vaccinium Angustifolium (Blueberry) Fruit Extract**, Sodium Hyaluronate**, Camellia Sinensis Leaf Extract**, Erythrulose, Potassium Sorbate, Sodium Metabisulfite, Butylene Glycol, Xanthan Gum**, Citric Acid**, Sodium Benzoate, Fragrance**. *Organic. **Natural. 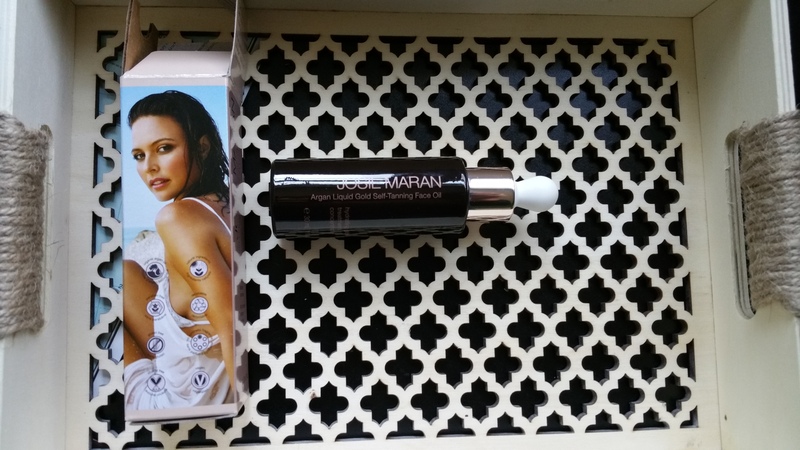 Unfortunately I could not find the ingredients for the body form of this item: Josie Maran Argan Liquid Gold Self-Tanning Oil, on Sephora, but I did find it on Josie’s own site!. Note the body formula is a waaaay better deal per ounce ($8.85/ ounce) and comes in a choice of three scents: Vanilla Apricot, Tropical Orchid, and Tahitian Vanilla. It’s nice to have choices. Below are the ingredients in the body/original form of the Liquid Gold oil. Josie Maran Liquid Gold Self Tanning Oil Ingredients: Aqua (Water)** (and) Aloe Barbadensis (Aloe Vera) Extract*, Cyclopentasiloxane, Dihydroxyacetone**, Argan Oil Isostearyl Esters**, Glycerin**, Caramel Color**, Ethylhexylglycerin, Cocos Nucifera (Coconut) Fruit Extract**, Sodium Metabisulfite, Tocopherol, Argania Spinosa (Argan) Kernel Oil*, Prunus Armeniaca (Apricot) Kernel Oil**, Sodium Benzoate, Potassium Sorbate, Chlorphenesin, Camellia Sinensis (Green Tea) Leaf Extract**. I think I just convinced myself to get the body version in Vanilla Apricot this time!!! So what have you been using, out there? Do you like the new concept self-tanners or do you still have troubles with the whole lot of them? I’m always interested to hear what people think. *However, I remind you, doing it my way is against product instructions. I am not recommending you disregard the packaging and warnings. Use common sense.